The sultana is a “white” (pale green), oval seedless grape variety also called the sultanina, Thompson Seedless (United States), Lady de Coverly (England), and oval-fruited Kishmish (Turkey, Palestine). It is assumed to originate from the Asian part of the Ottoman Empire. In some countries, especially Commonwealth countries, it is also the name given to the raisin made from it or from larger seedless grapes; These are typically larger than Zante currants (which are actually a kind of dried grape, not currants in the botanical sense), and the Thompson variety is smaller than many seeded raisins. In the USA and Canada, the name “raisin” is applied to all dried grapes, so that the breakfast cereal known “Sultana Bran” in Australia and the United Kingdom is called Raisin Bran in the United States and Canada. 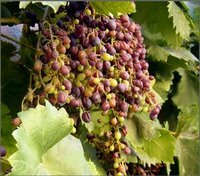 Water the “Thompson Seedless” regularly during the vine’s first growing season; keep the soil moist as the roots grow and establish. During the subsequent years, deep water the vines twice a month. Always water during extended hot, dry periods. Prune the grapevine back in winter when it is dormant; January through March is the ideal period. Cane-prune each “Thompson Seedless” plant by removing all canes other than the two to four strongest new fruiting canes with a diameter of 3/8 to 5/8 inch. Generally, canes on the top of the vine are exposed to more light and will have more buds. Leave about 50 to 80 buds per plant. If late during the summer the vines appear too heavily hung with grape clusters, remove the smaller and weaker cluster to allow the remaining clusters to grow.